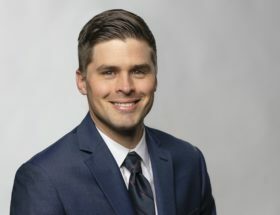 Prior to joining DKP, Blake served as the Policy and Research Specialist for the Indiana Tobacco Prevention and Cessation Commission of the Indiana State Department of Health, where he was responsible for monitoring trends, issues, and policies at the local, state, and national level. He also engaged in policy research, analysis, and evaluation, provided training and technical assistance to clients, and lead task forces on various health topics. Blake has experience in strategic planning, community outreach and implementation through media advocacy and community education, and working with coalitions. He also has an understanding of the state and local legislative process. In his current role, Blake is responsible for monitoring policy changes and trends within the Medicare Fee-for-Service Program. He also provides monitoring and tracking support for the DKP PayerScope® market monitoring services for Medicaid, and commercial payer policy changes, as well as healthcare reform implementation activities. He works with the firm’s detailed payer tracking database and performs policy and reimbursement research, analysis, and client notification activities. Blake holds a Bachelor of Arts degree in Religious Studies from Indiana University and a Master of Public Health degree from the Indiana University School of Medicine Department of Public Health. Michaelangelo (Mikey), named after his owner’s favorite action heroes, the Teenage Mutant Ninja Turtles, is a full-bred Pug with a zest for life and always views the glass as half full. Known for his limitless energy, playful nature, and fixation with licking, he constantly strives to make the world a better place for every human and creature known to man. Mikey joined the DKP dog crew in 2013, where he quickly made his presence known by sounding off his high-pitched bark to greet visitors and chase his brother, Donny, around the office. Although he may be stubborn at times, his loving nature cannot be matched. No matter what the circumstance, Mikey is always quick to share a toy, shower someone with licks—thousands, if he had his way—or provide some P.L.C. (Pug Love and Care). And his ever-wagging, curly tail; large, expressive eyes; and wrinkled face can make anyone smile. 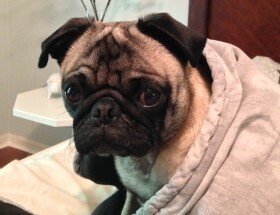 All he asks for in return is a lot of food and constant human-to-Pug contact. Mikey received his education from PetSmart training classes, where he earned high honors for his behavior (only because they provided better treats than what he receives at home). On several occasions his groomer has described him as “such a gentleman.” He is naturally brilliant and nosy (despite hardly having a nose), always jumping into every situation with a snort or grunt to offer his help. His positive outlook, loving nature, and limitless energy are great assets to the DKP culture. Donatello (Donny), also named after his owner’s favorite action heroes, is a charmer who joined DKP the same year as his brother Mikey. This part Pug and Boston Terrier (a.k.a. Bug) is constantly searching for human companionship. He will lure you in with his sweet puppy eyes and then hop on your lap without warning, regardless of the height. 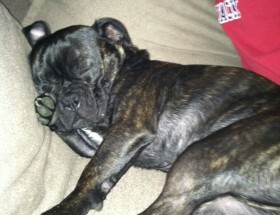 Although Donny is highly athletic with energy that matches that of his brother, he mostly enjoys sleeping. A perfectionist at heart and a comfort lover, he is often found spending minutes upon minutes spinning in circles trying to pat down the area where he is about to lay until it is perfect. He can be a bit high-strung, and often feels the need to prove himself. When not striving to please humans or get comfortable, much of his energy is put into outperforming his brother in everything and trying to take on bigger dogs to show he is just as powerful as them. These qualities all stem from his desire to be the top dog; he is a high achiever striving for success. Donny also received his education from PetSmart training classes, where he earned high marks for improving his behavior. He is also naturally brilliant, but not as nosy as his brother (even though his snout is longer than Mikey’s). He knows when it is necessary to get involved in a situation and when he should keep his distance. His desire to be the best and to please all humans, as well as his sweet demeanor, are also great assets to the DKP culture.